We Complete a Journey | Sprezzatura, Y'all! The train from Florence to Interlaken goes first to Milan, where you change trains, then through a few northern Italian towns, and into Switzerland; but you don’t even know when you’ve crossed the border (there are no, “Leaving Italy”, “Welcome to Switzerland” signs). There are two more train changes before you get to Interlaken. Interlaken is a beautiful town located between two lakes, hence the name Interlaken. It’s set down in a valley surrounded by the Alps. Just to the south, is one of the most impressive peaks in Europe, the Jungfraujoch. We couldn’t see anything when we got there because of the bad weather, so we just walked around town some and looked for a place to have a snack. We hadn’t had anything since breakfast and needed something to hold us over till dinner. Apparently, they don’t really do snacks in Switzerland. They do hearty, stick-to-your ribs, keep you warm in the Alps food. 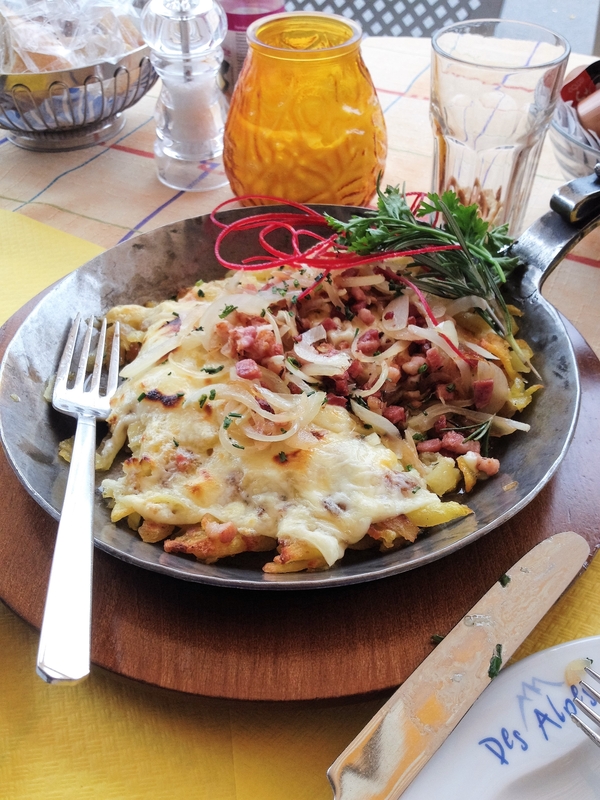 We stopped in a little place and shared a rosti, which is a typical Alpine dish that is like a pizza with roasted, shredded potatoes as the crust. Basically, hash browns. Then it’s topped with whatever. Ours had onion, bacon and cheese. It was good and we gobbled it down, but it filled us up more than we would have liked. Switzerland is picture perfect. The cities are clean and charming, the trains are top notch and run right on time. All that perfection comes at a price. It’s incredibly expensive. Forget having a meal for less than $30 per person. A glass of wine is about $10. A bottle of water is about $3. A small bottle. Once we declined the water that came in at $5.50 a bottle. We were so used to Italy, where you can get a fabulous meal for two with a bottle of wine for less than $40. A bottle of water is expensive if it’s $1. A glass of wine often is less than water. We weren’t in Italy anymore. It was impossible to get used to that. It almost made us not want to eat. No offense to Switzerland, but the food was rich and heavy and was not nearly as good as Italian food but twice as expensive. But we weren’t there for the food, we kept reminding ourselves. We had two full days in this area and we wanted to make the most of it. The weather was much better the next day, still a little overcast, but blue skies visible. It had promise. 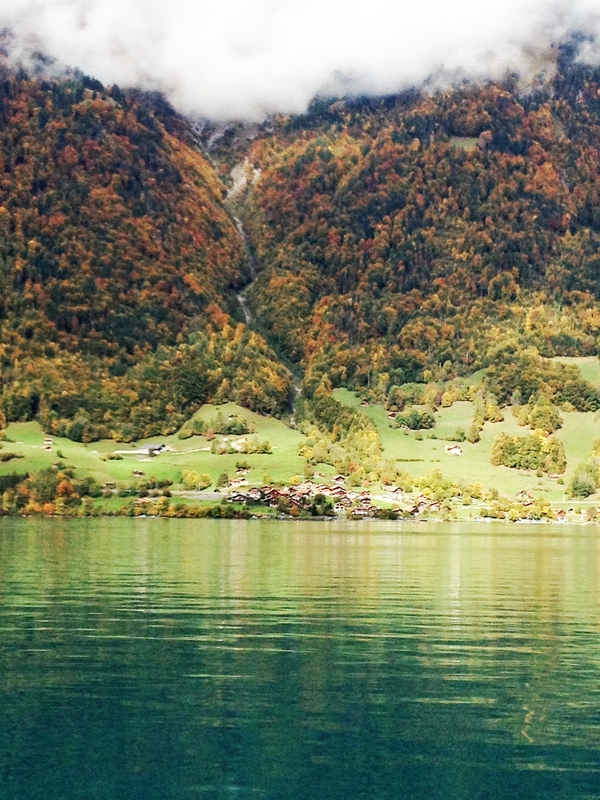 We went for a boat ride on one of the lakes, Lake Brienzersee, the eastern-most lake. The cruise took us around the lake to the far side and we got off at the village of Brietz. It took about an hour and twenty minutes to get there and the day cleared up, the sun came out, and the magnificent scenery revealed itself. 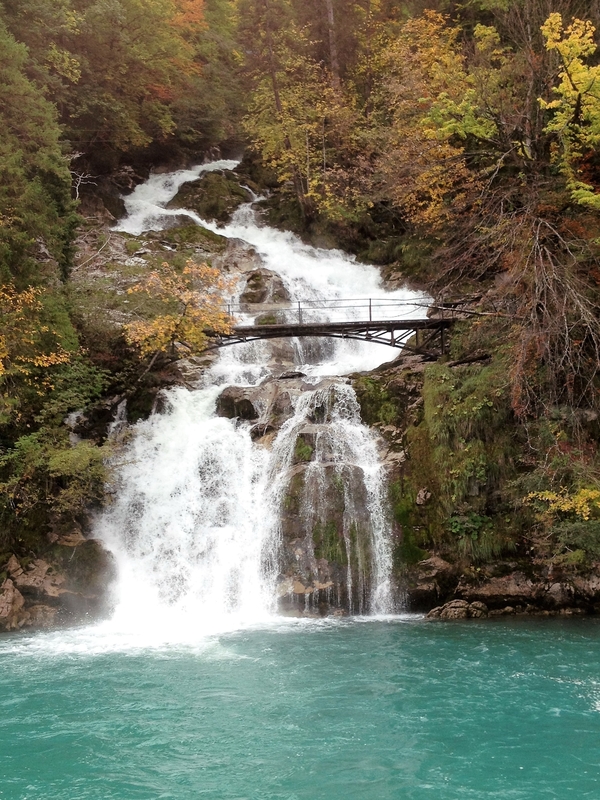 It was a perfect time to be in Switzerland because the fall color was gorgeous. It wasn’t hot and it wasn’t very cold yet. Many other people felt this same way because it was full of tourists. It was a very international crowd – Americans, Germans, Middle Easterners, Asians – it was indeed a melting pot of cultures. Seems it’s always a good time to be in the Swiss Alps. The landscape there is impossibly beautiful. The colors are unique – brilliant green grass, clear, stone blue water, rich brown earth. They combine together to make views that you can’t believe. You snap pictures, knowing that there’s no way this grandeur can be captured on film. You close your eyes because you think scenery like this can’t be real. But when you open them back you see that it is indeed real and that you’re in the middle of it. You feel of the lake breeze on your face, smell the fresh water and rich earth, and everywhere you look you see beauty. There’s no bad view. You can’t miss out on anything because even if you don’t see it all what you saw was enough. It made me think of my religion post. For those avid Sprezzatura Y’all readers, I’m sure you remember my religion post. I felt like we were in the greatest cathedral of all. All the majesty and holiness you could ever ask for was right in front of you. After the lake tour, we took a funicular up to the top of Harder Kulm, the highest point in Interlaken. Interlaken is at 1,870 feet above sea level. 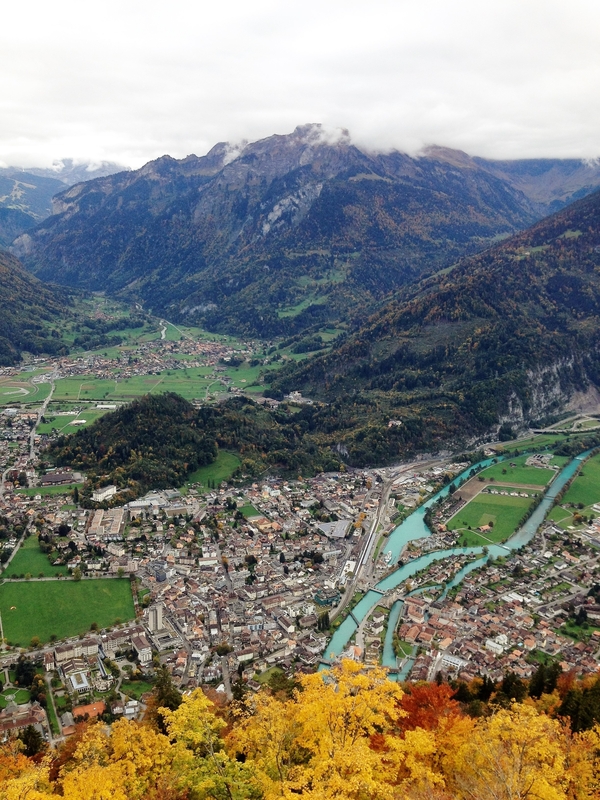 The Harder Kulm is 4,337 feet and is just north of Interlaken. In eight minutes we were at the top after our almost vertical funicular ride. The views from there are amazing. There is a cliff walk that you can go out on and feel like you’re hovering over Interlaken. 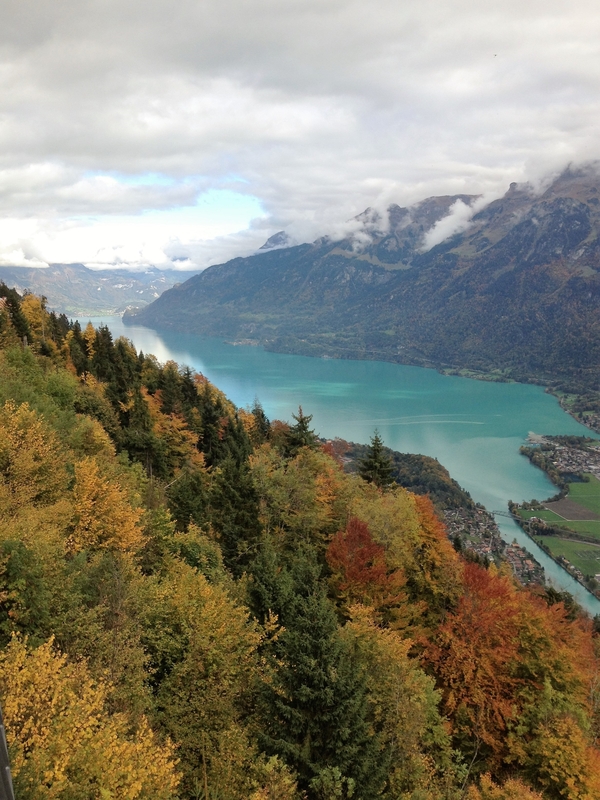 You can see both lakes, the canals that connect them, the sprawling town and the dramatic mountains to the south of Interlaken, dominated by the peaks of Munch, Eiger, and Jungfraujoch. Although it had cleared up significantly by then, there were still a few clouds over those peaks. But the next day we would see them all, up close and personal. Because of all the International tourists who visit this part of Europe, there are several international restaurants in Interlaken. There are many Chinese and Indian spots, and we even saw a Mexican restaurant. Since we had three nights, we decided to do one of them at an Indian restaurant. We love Indian food and are not likely to get it at all in Italy, so we thought, why not? It was quite good, quite unexpected, and quite expensive (no surprise there). 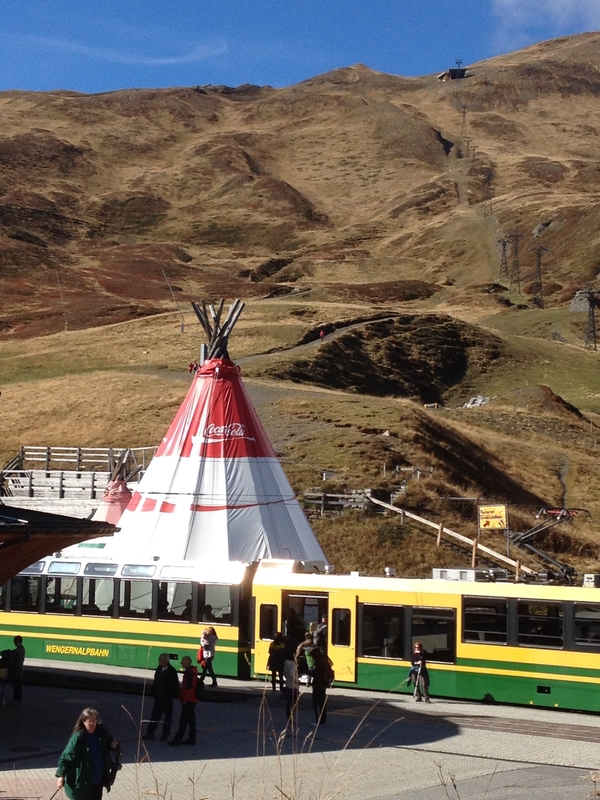 It was odd, though, having Indian cuisine in the heart of the Swiss Alps. The world is a remarkable place. The next day we went on the scenic railway from Interlaken to the Jungfraujoch. The Jungfraujoch is the highest rail station in Europe and is at 11,332 feet. The tip of the mountain is another 2,000 above that. Pretty high up there. 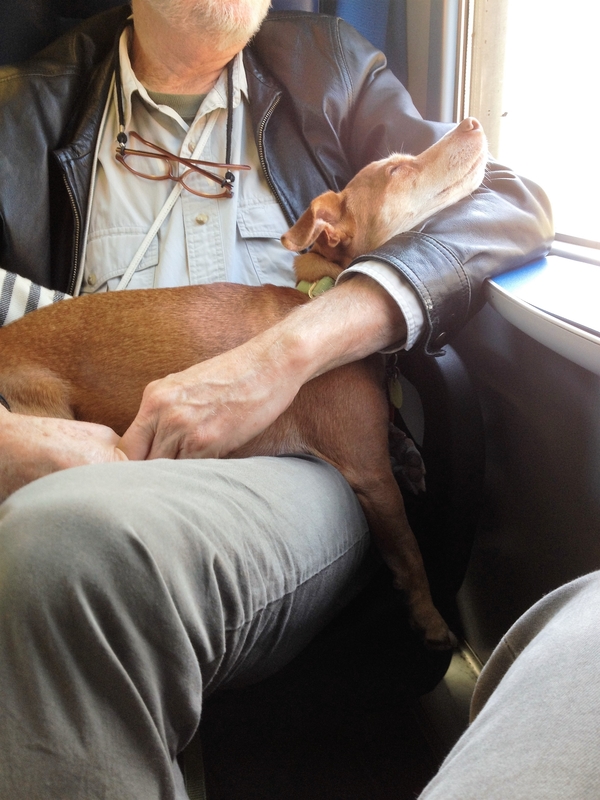 We had Millie the dog with us, who has turned into quite the seasoned traveler. She knows when the train is getting ready to stop and knows how to go up and down the boarding stairs. She’s adapted quite nicely to this lifestyle. I can’t recommend this rail experience enough. We balked at the price, it seems outrageously expensive. But what you get is priceless. 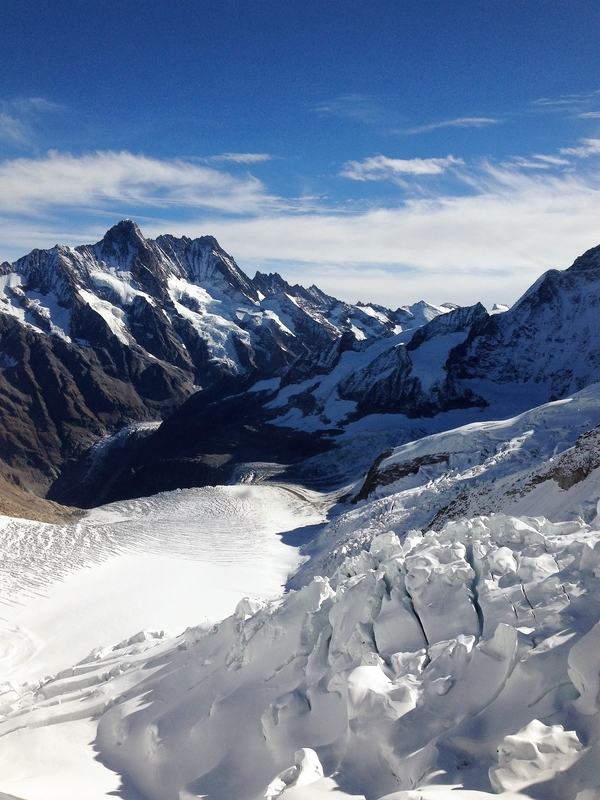 Let me say that if you’re ever considering doing this trip, the price includes a complete tour of the Jungfraujoch that takes about one-and-a-half to two hours. It’s like buying a ticket to an amusement park – you get all the rides included for the admission. On the way back, Steve, who was even more reluctant than I to fork out this money, said it was worth every cent. I really can’t say more than that. There are two rail routes from Interlaken to the Jungfraujoch. They take about the same time, but you see different sights on each. We went up one way and came down the other. The train from Interlaken to Lauterbrunnen, the way we went up, is a regular train. Then when you get to Lauterbrunnen, you switch to a cog wheel railway that starts to take you up the mountain. The cog wheel rail is a train that has gears on the bottom that hook onto the cogs running down the middle of the tracks. 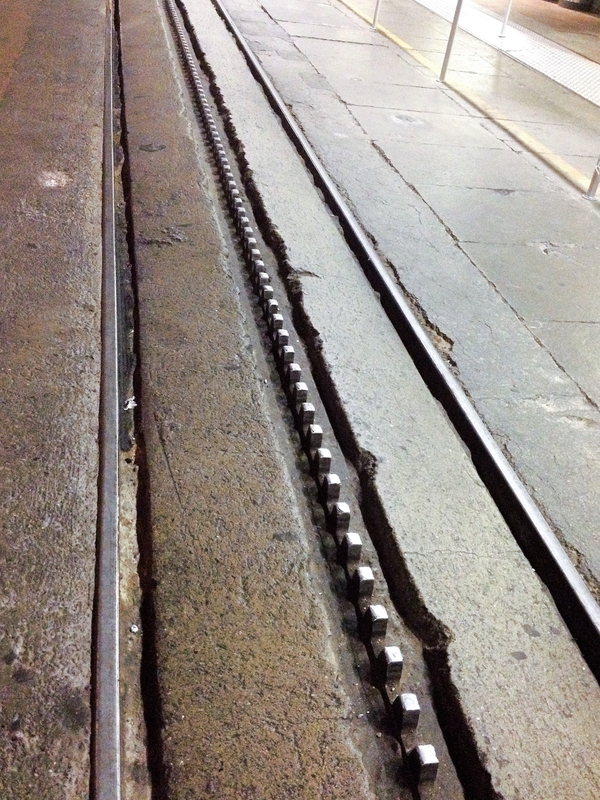 This helps pull the train up the steep inclines to come. And they are steep. The train stops along the way in little alpine villages that I’m sure are ski resorts in the winter, but in the summer and fall are hikers’ paradise. We agreed that if we ever go back there, we’ll get off the train and hike between a couple of the towns. The views are unbelievable. There are two more train changes and two stops for photo opportunities. The last part of the trip is through a tunnel going through and up the mountain. Along the way, there are two places that have huge plexi-glass windows that offer great views. They’re great teasers for what’s to come. 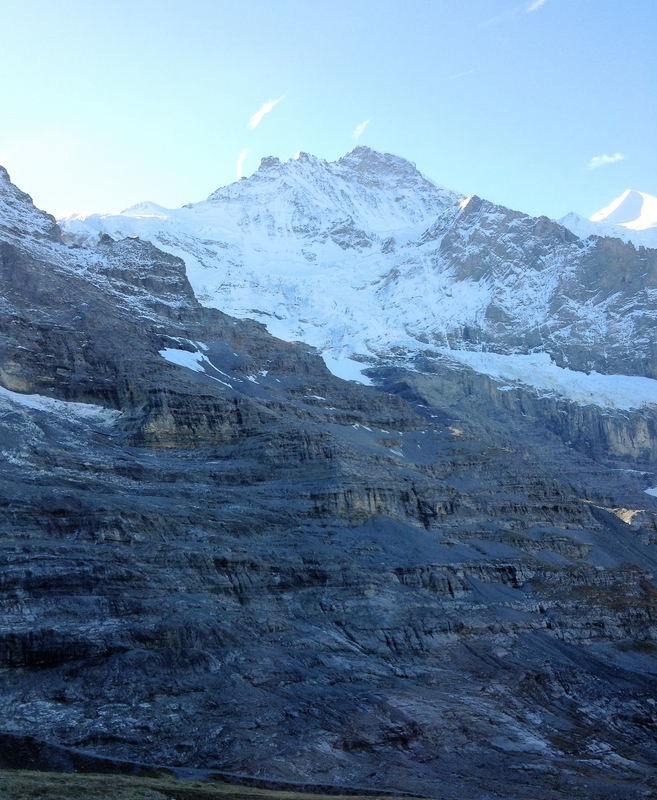 The Jungfraujoch is quite an experience. You get off the train inside the mountain and walk into the building through a tunnel. The building has glass walls that give you a panorama of the mountaintop. It’s truly amazing. There are three or four restaurants up there and they all do a brisk business. 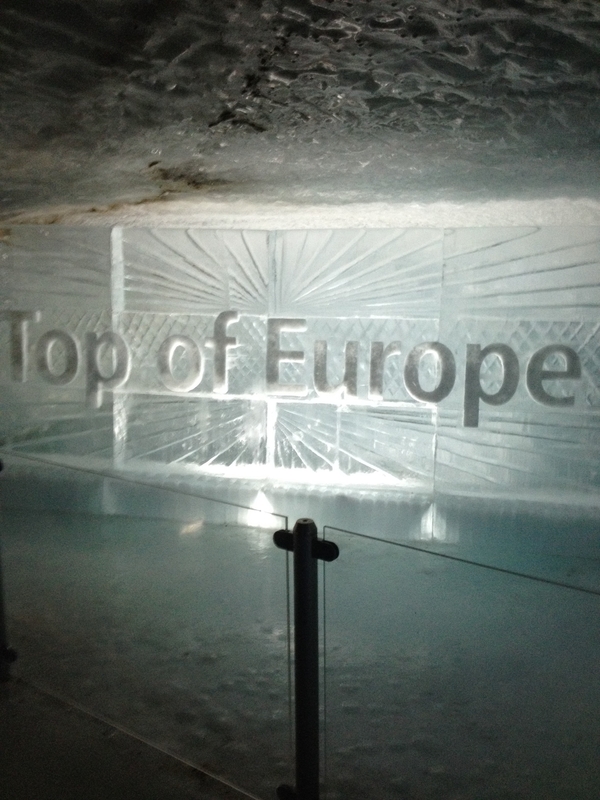 As expensive as it is in Switzerland, the Jungfraujoch has it all beat. This is where we refused to pay $5.50 for a small bottle of water. You’re captive up there, so plan accordingly. 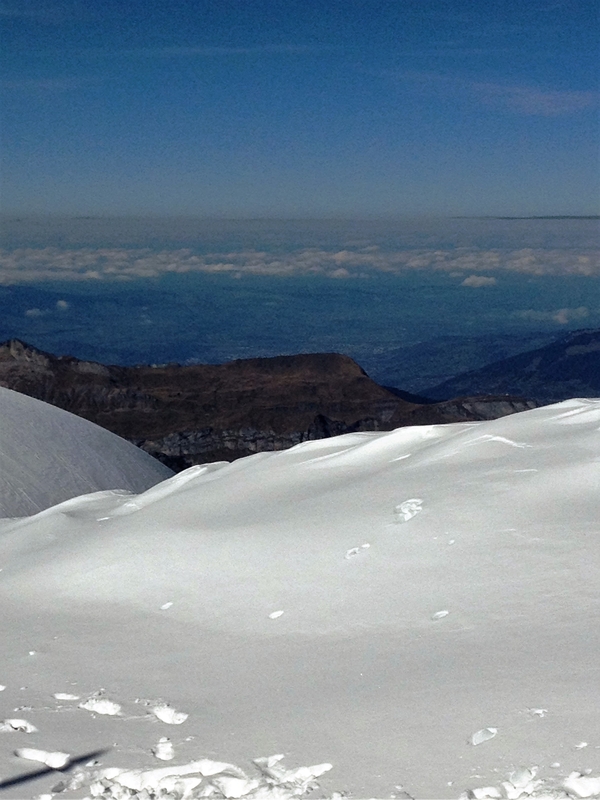 We chose to power through and not eat there, but with the altitude that can be tricky. Once inside the building, you follow the Tour signs through the entire complex. It takes at least one-and-a-half hours and could easily take more than that. First you go to a viewing platform. Part of it is inside and you can go outside as well. This is where you get the first sense of how cold it is. When we left it was coolish – you needed a jacket, but just a light one. It was 28 degrees up there. Very cold. The sun was bright and reflected off the snow and ice and it was absolutely brilliant. But still cold. Then you go through the Ice Palace which is just what you’d think. 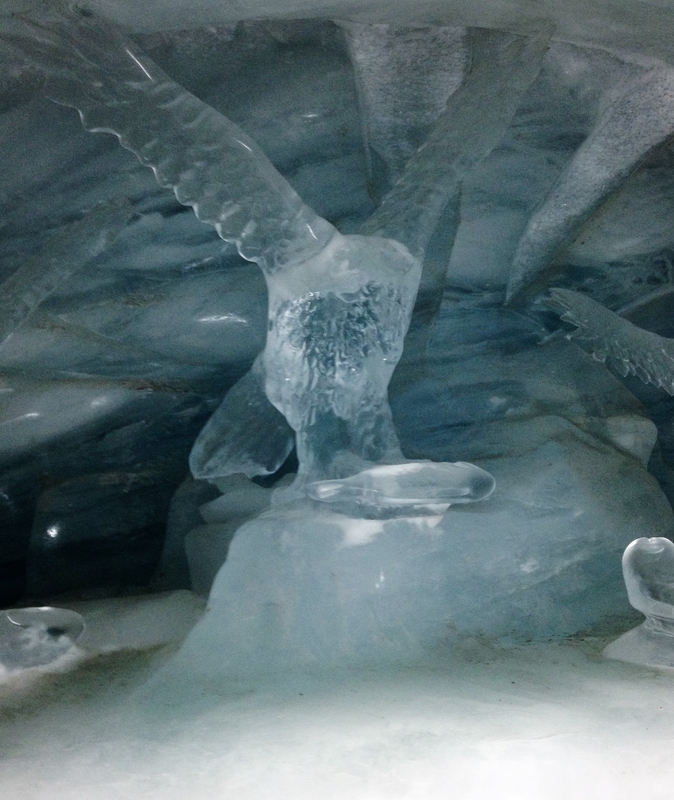 An enormous cavern carved out of the ice. It’s a maze you walk through with ice sculptures and niches. It’s really something – very cool, literally and figuratively. The next stop on the tour is the glacier. 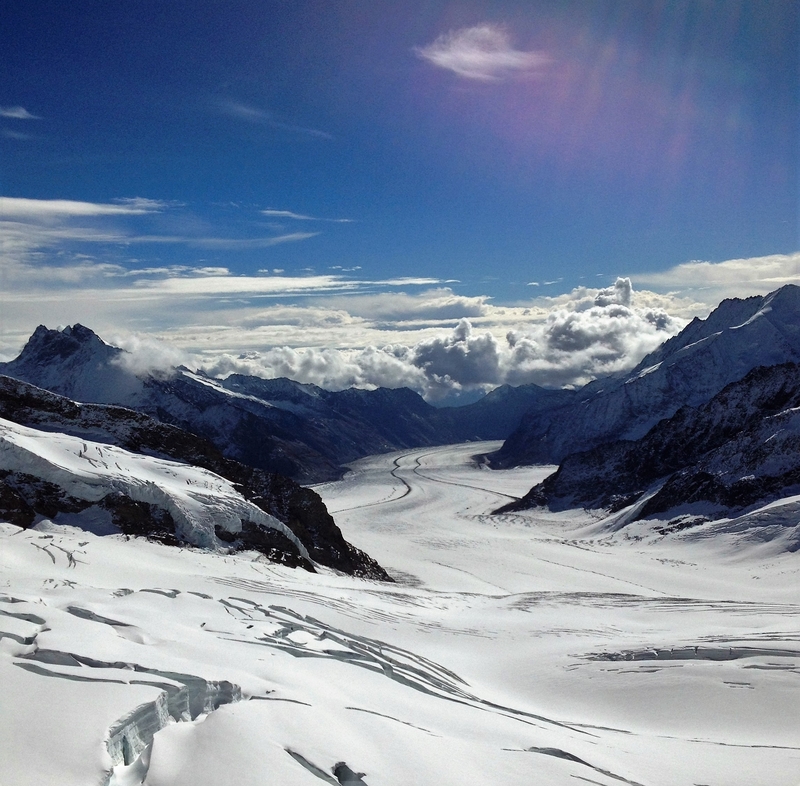 The Aletsch Glacier is the largest glacier in the Alps. It covers about 46 square miles. Of course, it, like most glaciers, is shrinking. But to get to walk out on the glacier was an incredible experience for someone who is used to an inch of snow maybe once a year. The train trip down was very different from the one going up. 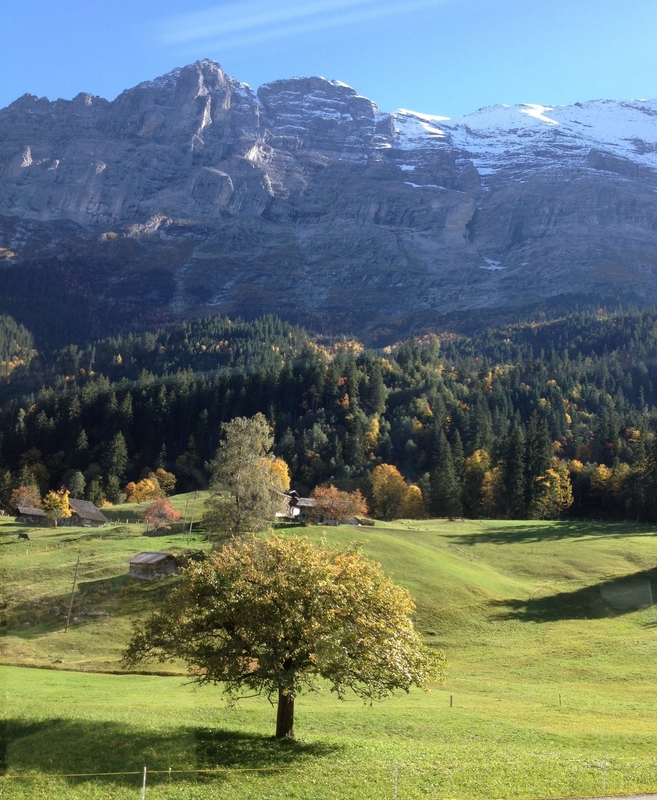 The route took us through Grindelwald instead of Lauterbrunnen and it was much more bucolic. This route goes to east and the landscape is more green and gentle. I imagine this is where Heidi frolicked around with her grandfather’s goats. The cows all have bells and graze in the meadows. 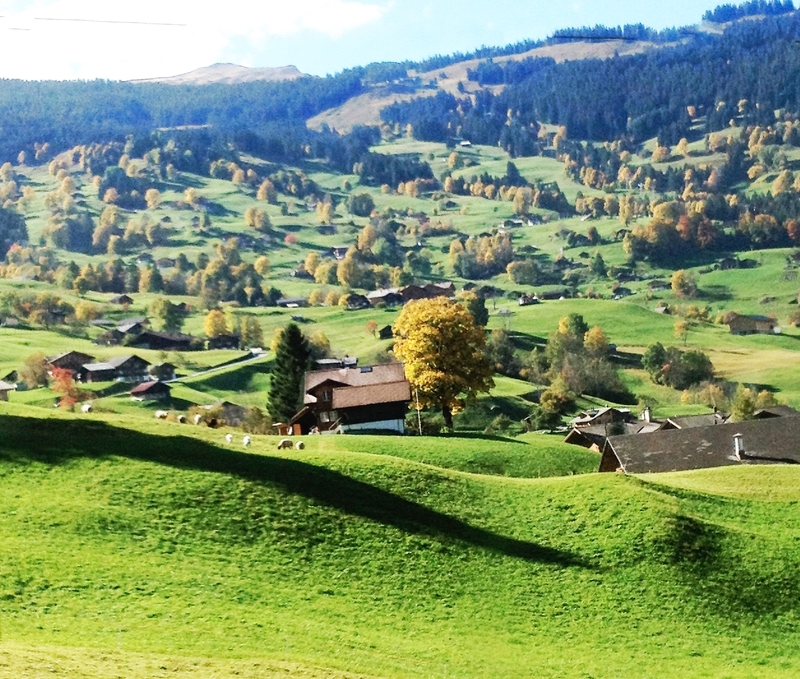 The villages are straight out of a story book with steep pitched chalets and incredibly green pastures. Oh, and the Alps in the background. One of the unique things about Interlaken was the placement of markers throughout town stating various principles from the Universal Declaration of Human Rights. It’s very inspiring and appropriate for this place that attracts so many people from all over the world. One morning I was walking Millie and was outside a Catholic church. A Muslim woman with a head scarf on was standing on the steps of the church. Just outside the church was a marker dedicated to religious freedom. Perfect. Our journey was wonderful – we saw things we’d never seen, experienced glorious beauty and majesty, and breathed the clear, cold mountain air. We had a nice, relaxing train trip back to Italy and even though we loved our experience we were very glad to be back in Anghiari. It felt like home. Breathtaking views!! And I love the markers stating principles from the ‘Universal Declaration of Human Rights’. Those sentiments would be as beautiful as the views! It was a beautiful complement to the setting. Really made you stop and think about what’s going on in the world and about how you treat others in the course of everyday life. Yes, it was truly incredible. One I’ll remember for a long time.